There are certain Christmas presents that I will always remember. I have often told Amara about the perfume set that I got when I was a little girl. Amara loves to take bubble baths and play chemist while she is in the tub. She mixes different bubble baths together to get different fragrances. I am required to smell each one. 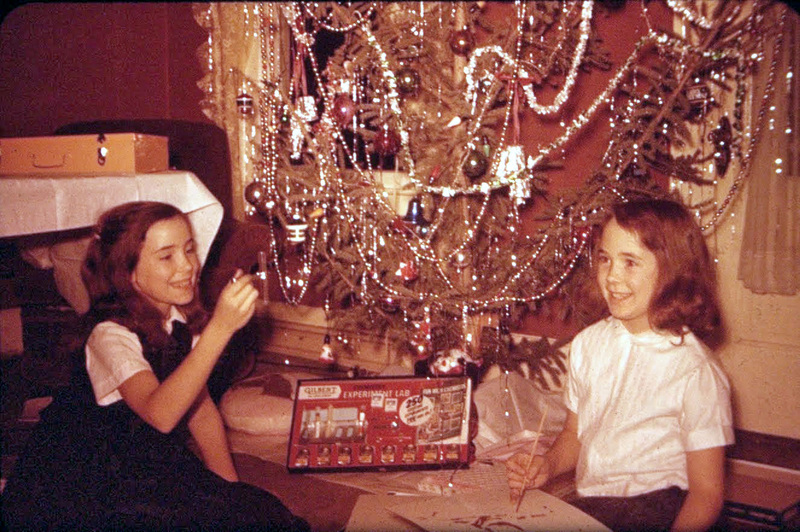 Our love of mixing fragrances is a special bond so I was so thrilled when Sandy found this picture of Judy and me with our Christmas gifts that I cried – it was my perfume kit! That picture proved the perfume kit had been real and not just something that I had imagined. It was like a chemistry set only for making your own perfumes. The picture was just as I had remembered it in my mind. I know I spent hours up in our room combining different things. I was never thrilled with the results but I had a lot of fun trying. Thinking back on it our room upstairs must have been very fragrant! When I saw the pictures, even more memories came flooding back. I remembered the present Judy had gotten. It was a paint-by-numbers oil painting of a horse. She loved horses and she loved paint by numbers kits so this was one of her favorite presents. We each had our things. She wanted nothing to do with my perfume and I hated doing paint by numbers. I was really bad at them! I think these pictures are from 1958 or ’59. What a great Christmas that was for both of us. Most of you have probably seen comments by Sandy. Sandy is my little sister and the one that I stayed with in Michigan two years ago. Sandy won’t come into my life until I am 20. It is a wonderful story and I will write it soon. In the meantime my awesome sister has been going through lots of our Dad’s old pictures, scanning them, and sending them to me. She really is the best. This memory was posted in Memories FOR Amara and tagged chemistry, Christmas, Kc the child, perfume on April 25, 2014 by Grandma Kc. Such great memories of your childhood! I wish I could have been there! So glad our paths finally crossed! I love sharing these old stories with you and I do appreciate all of your help in getting me the pictures. One of the best things Daddy ever did was to make us sisters! Your pictures are so much like mine from that exact same era that I could just put myself right inside of them! You and your sister were so cute! I vividly remember my chemistry set and how much fun it was to play with the litmus paper. I wasn’t really someone with a scientific brain so it didn’t do me any good, but it was cool to have one those sets then. I remember the paint by number sets too. Yikes. Never had the patience to finish the few I got! These must have been some of the first colored pictures that Dad took. I love that he took so many of them! Of course that is where I get the camera gene from and I passed it to Jenna who gave it to Amara! At least we don’t have to pay to get them developed! I don’t remember being a budding chemist, but I do remember that my daughter was always in the bathroom or the kitchen stirring up magic mixtures of random substances at about that age. Amara’s dresser is covered in little bottles of bubble bath – we keep adding to the collection. I have had to limit her to only 3 in the tub at a time – plus various empty bottles or she would take everything in there! She has to have extra empty bottles so that she can mix things into them. She even has one set that looks like test tubes and has a holder. I think she takes after her Grandma! I bet Valentina will be surprised at all of the things she has already forgotten! I don’t know if you can do it with Windows 8 but with Windows 7 I have the screen saver go to my Pictures folder – which goes back 10 years of Amara – and she loves watching it. Of course we do, too. ! I bet Valentina would love it. How wonderful to have a copy of that photo! It’s amazing, isn’t it, how one photo can bring back a flood of memories? It sounds like you must have had a great time concocting perfumes! Sometimes photos really do bring things back and I am so glad Sandy found these pictures for me. My sister definitely got the art gene from Daddy – I got his camera gene! Amara and Jenna got both! This was a fun read and the tree reminds me so much of ours when I was a little girl! I had to smile comparing Amara with her bath fragrances and you with your set …:) Love it! You kind of have us figured out – we were always getting into something. But not this time! I’m so happy your sister is sharing the many photos with you. What a wonderful one to bring back memories of your perfume-making days. 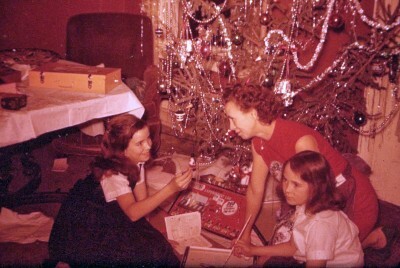 I actually bought my middle daughter a perfume-making kit for Christmas one year. She loved it. Her younger sister got a Pet Vet kit that same year, so just like you and your sister, the Christmas gifts perfectly matched their personalities and loves. Thank you for reminding me of that with this sweet post. I love that these posts and pictures bring back so many memories for so many. I am so lucky that Daddy took sooooo many pictures – and that Sandy is scanning them for both of us! Another post that Amara is going to love. And I did too; just as it did for some of the other commenters, your pictures brought back memories of my own Christmases Past. Thank you. I am glad you enjoyed it! I’m finding that some of the comments remind me of other childhood memories – more posts. While I LOVE living in the digital age it will be kind of sad that so many pictures won’t get printed and be there for someone to find many years from now. Aren’t these old photos the best? I would have been the one doing the paint by number horses (I even mentioned that in a post once), but I also would have enjoyed the perfume kit! I cannot believe you have sweet sweepers every week! We get them once a year, in the springtime when the winter storms are no longer a threat. Baby would go crazy if she had to put up with them every week!! About those street sweepers we have in southern California – I tend to believe the whole thing is just a revenue generator! For almost all neighborhoods trash day is followed by a 3 hour window sometime the next day for the street sweepers. No parking signs are posted as you enter a neighborhood and where almost no one will see them! If you are forgetful enough to park on the street during that 3 hour window you will get a nice ticket! Last I knew they were a $55 parking ticket. The theory is to sweep up any trash as a result of the trash day but really it is very excessive and yes the cats hate it! Love reading your blog and all your memories. Thank you for sharing. Thank you for your kind words! I love writing about Amara and I am so glad that my friend talked me into adding the memories from my own childhood. It is a lot of fun to think back on it all! What a special story! It’s amazing how photos can open the floodgates to memories! I am so glad that my Dad always had a camera in his hand. I love looking at all of them – gets a bit frustrating sometimes when I see a face I should know and can’t remember. There is no one to ask anymore.